Something I’ve wanted to do for a while – and have added to my Epic Quest as extra motivation – is create a silly side-project. A bit of fun to work on in my free time for no real purpose than to make someone (even just me) smile for a minute when they see it. The result so far is DevIceCream.co.uk, ‘spontaneous ice cream for digital types’. The idea being that people can follow a Twitter account (or hashtag) or sign up for ‘ice cream alerts’, which will go out spontaneously on sunny days, summoning people for ice cream in Leeds. In the summer of 2012, while working at Cloudspotting, Philip – another developer in Leeds – arranged a spontaneous walk up to an ice cream van in town with some other design/dev types. Fun was had, debates raged over the proper name for kali/sherbet, and ice cream was consumed. A nice lunch-time meet-up courtesy of Twitter. Philip christened it #twicecream – a portmanteau of Twitter and ice cream that all agree is terrible. There’s more to it than that – and I recommend you read the whole thread – but what I think Leonard was getting at is that a website can be set-up quickly and cheaply, and you never know what can come of it with a little perseverance. 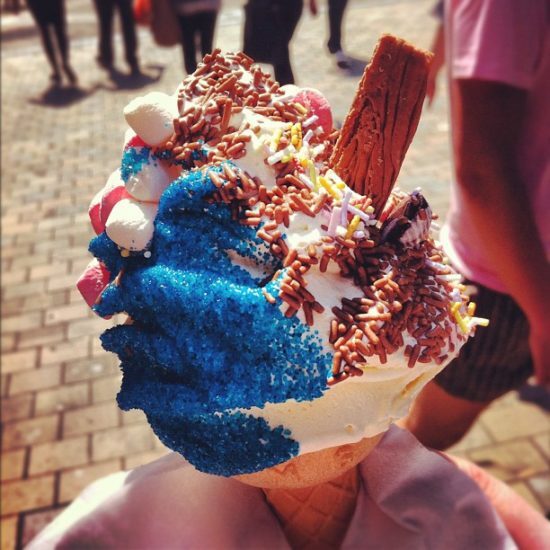 #Twicecream was mentioned again recently when the sun made an appearance in Leeds (ice cream didn’t happen). I suggested a different name – #DevIceCream (geddit?) – and someone jokingly suggested buying the domain name. Later on, I did buy the domain and I quickly set up a quick site. Trying to see what I could launch with minimal expense, I included a Mailchimp form sign up, and my mate Matt offered to design the illustrations for me, so the whole thing so far has cost just a few pounds! If it leads to meeting up with mates once or twice this summer, I’ll count it a success. Mainly, I built this as a fun little challenge for myself – a way to do something different. I’m looking forward to seeing what comes of it!